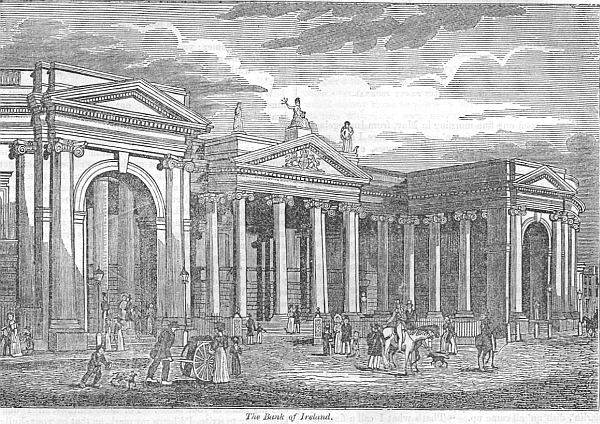 The Bank of Ireland (Dublin). This truly beautiful and magnificent building, which, as all our readers know, was originally the Parliament House of Ireland, though considerably changed by the internal adaptations necessary for its present purpose, is fully entitled to the character given of it in 1791, by the very talented James Malton--"that it is no hyperbole to advance, that this edifice in the entire, is the grandest, most convenient, and most extensive of the kind in Europe;" and with equal truth he observed, that "it derives all its beauty from a simple impulse of fine art; and is one of the few instances of form only, expressing true symmetry." Indeed, so truly classical is this fine edifice in its proportions, so grand in its simplicity, that it is not saying too much of it, that it would have done honor to the best days of grecian art; and with such an example before us--one which gives delight to all persons imbued even with the slightest sentiments of taste--it is strange that it should hitherto have had so little effect on the architectural taste of our country, and that nothing comparable to it, and very little of a similar refined character, has been ever raised in the country since the period of its erection. The centre portico of this magnificent structure, which is the subject of our present illustration, consists of one, grand colonnade of the Ionic order, occupying three sides of a court-yard, and resting on a flight of steps continued entirely round, and to the extremities of the colonnade, where are entrances under two lofty archways. The four central columns support a pediment, whose tympanum is ornamented by the Royal Arms, and on its apex is placed a statue of Hibernia, with one of Fidelity, on her right, and another of Commerce, on her left. These statues were executed by our fellow citizen, John Smyth, that of Hibernia being modelled by his father, and the other two by the celebrated Flaxman. This magnificent centre is connected with the eastern and western fronts, which almost contend with it in beauty, by circular screen walls the height of the building, enriched with dressed niches and a rusticated basement. The western front, which is a beautiful portico of four Ionic columns surmounted by a pediment, preserves an uniformity of style with the centre; but the eastern one, which was originally the entrance to the House of Lords, is of a different style, being of the Corinthian order, and consisting of six columns, crowned by a pediment with a plain tympanum, on which stand three fine statues by the elder Smyth, emblematic of Justice, Fortitude, and Liberty. Though this portico is in itself of the most exquisite proportions and beauty, the difference of its style from the other parts of the building is justly objected to, inasmuch as it destroys the symmetrical uniformity of the building as a whole. The defect, however, was accidental, and not attributable to any want of judgment on the part of its accomplished architect, but caused by a desire on the part of the Lords to have their entrance of a different and more ornamental character than that appropriated to the Commons; and it is related as an instance of the ready wit of Mr. Gandou, that a gentleman passing while the workmen were placing the Corinthian capitals on the columns, struck with the incongruity, having asked "What order is that?" the architect, who was present, replied, "It is a very substantial order, for it is an order of the House of Lords!"